Anti-masons will attempt to embarrass freemasons by quoting Hitler in praising Freemasonry. But this sentiment only appears in Hermann Rauschnings anecdotal writings and is nowhere else corroborated. Regardless, Hitler is only recorded in referring to his perception of Freemasonry as an example of how he wanted the Nazi party to develop, specifically with an hierarchical organization and initiation through symbolic rites. The record of his actions and writings though, clearly demonstrate that he despised and feared the principles and beliefs of Freemasonry. While the excuse for the Kristallnacht of November 9-10, 1938 was the assassination of Nazi diplomat Ernst vom Rath, the mobilizing slogan employed by the Nazis was "Death to the Jews and the Freemasons." "On Hitlers rise to power, the ten Grand Lodges of Germany were dissolved.3 Many among the prominent dignitaries and members of the Order were sent to concentration camps. The Gestapo seized the membership lists of the Grand Lodges and looted their libraries and collections of Masonic objects. Much of this loot was then exhibited in an "Anti-Masonic Exposition" inaugurated in 1937 by Herr Dr. Joseph Goebbels in Munich. The Exposition included completely furnished Masonic temples. "To strengthen his political position he [the Jew] tries to tear down the racial and civil barriers which for a time continue to restrain him at every step. To this end he fights with all the tenacity innate in him for religious toleranceand in Freemasonry, which has succumbed to him completely, he has an excellent instrument with which to fight for his aims and put them across. The governing circles and the higher strata of the political and economic bourgeoisie are brought into his nets by the strings of Freemasonry, and never need to suspect what is happening. 1. 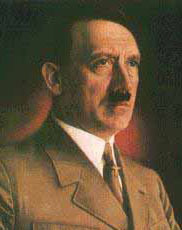 Painting of Adolf Hitler, artist unknown: Imperial War Museum. 2. Hitler Speaks, Hermann Rauschning. Andover: Chapel River Press, 1939; Gespräche mit Hitler, Paris, 1939 ; The Voice of Destruction, New York: Europa Verlag, 1940. Hitler m'a dit. Confidences du Führer sur son plan de conquête du monde, etc. (Traduit par Albert Lehman.) Cited by Hitler and the Age of Horus, Gerald Suster, London : Sphere Books, 1981. xviii, 231 p.,  p. of plates : ill. Bibliography: p. 215-216. Includes index. ISBN: 0722182872 p. 138. Rauschnings writings were presented as Allied prosecution exhibit USSR-378, at the International Military Tribunal at Nuremberg but dismissed by the OSS as unreliable. In May 1983, Swiss historian Wolfgang Haenel compiled the criticisms of Rauschnings books in a presentation at the Ingolstadt Contemporary History Research Center, demonstrating that Rauschning only met Hitler on four occasions, not the "more than a hundred" that he claimed. Words attributed to Hitler were copied from the works of Ernst Jünger (1895 - 1998) and Friedrich Nietzsche, Guy de Maupassant and Fyodor Dostoyevsky, with the assistance of two journalists: Emery Reves in Paris, and Henry Wickham-Steele in Britain. Hitler biographer Ian Kershaw discounts Rauschning. Also see The Journal of Historical Review, Fall 1983; Die Zeit; Der Spiegel, 7 September 1985. 3. The original text reads "Immediately on...." which subsequent research has shown to be less than accurate. Although Hitler became dictator on 23(24) March 1933, several Grand Lodges attempted to remain active and the Dresden and Leipzig Grand Lodges did not dissolve until 10 August 1935. For a review of German Freemasonry's attempts to reconcile themselves with the Nazis, see "German Freemasonry and its attitude towards the Nazi regime," Alain Bernheim. freemasons-freemasonry.com accessed 2007/03/07. 4. "The Annihilation of Freemasonry," Sven G. Lunden. The American Mercury, vol. lii, No. 206, February 1941. In essence true, based on false reports it failed to distinguish between the several German Grand Lodges, and their various responses to the Nazi government. users.libero.it/fjit.bvg/fascism.html accessed 2004/08/13. Cf. After Fifteen Years [-] Freemasonry in Germany [-] Report of the Special Mission sent by the Masonic Service Association of the United States to investigate Masonic conditions in Germany, 1949. Masonic Service Association, October 1949. Also see Große National-Mutterloge "Zu den drei Weltkugeln" im Verband der Vereinigten Großlogen von Deutschland Bruderschaft der Freimaurer 1933-2000 [.] Versuch einer Standortbestimmung. Schriftleitung Werner Schwartz. 3 Bünde. Berlin: Große National-Mutterloge "Zu den drei Weltkugeln". Cited by Alain Bernheim ; see above. 5. "European Freemasonry has been persecuted more thoroughly in the last twenty years than ever before in its turbulent history. Mussolini strangled Freemasonry in Italy in 1925. Hitler annihilated the German lodges when he came to power, and later those in Czecho-Slovakia, Poland, Norway, Holland, Belgium, and Greece. European Masons died, went underground, or fled." "Masons but Not Free," Newsweek, 25 June 1945, pp. 114-115. Cited by Paul Bessel bessel.org/naziartl.htm accessed 2006/01/22. 6. The brown book of the Hitler terror : and the burning of the Reichstag, prepared by the World Committee for the Victims of German Fascism ; with an introduction by Lord Marley. London: V. Gollancz, 1933. p. 234. 7. Lunden, The American Mercury p. 184. Also see, Hamilton, "Freemasonry, A Prisoner of War," in The New Age, September 1949, p. 552. 8. The New Age, Scottish Rite Southern Jurisdiction. October 1938. pp. 589-591. Also see www.bessel.org/naziartl.htm. 9. Mein Kampf, Adolf Hitler [1889/04/20 - 1945/04/30]. trans. Ralph Manheim. Sentry Edition, Eleventh printing. Boston, Houghton Mifflin Company: n.d. c1925. Verlag Frz. Eher Nachf, G.M.B.H. p. 314-15.